This utility is for checking reservation status of your ticket on Indian railways trains. PNR or passenger name record is a 10 digit code used in Indian train journey booking system. It is the record of all relevant details of a specific point to point journey by an individual or a group. The central reservation system maintains this data and is available to every booking station that is connected to the CRS. Every detail of the specific journey can be retrieved through this unique PNR number that is the key to the record. This code is generated when the CRS gets full data of journey like passenger`s name, gender, age, train number, journey class, berth preference, contact link, etc. After a ticket is booked, often the status may not be “confirmed”. As cancellations happen from the population booked on the train or some quota or other is released, the booking status will change. It is a "follow-up" process by which passengers are able to get updates about the status of their journey. As the status changes through various stages ending up as “confirmed”, the passenger can keep checking the status. When confirmed, he is shown the exact coach number and seat number so that he is able to occupy the right seat prior to the start of the journey. If, unfortunately, the ticket is not confirmed, the status is shown as canceled and the passenger need not go right up to the station saving him the hassle of going up to the terminus and return disappointed. The train route and its time schedule can be checked easily too. We have created this app to help out the passenger traveling across the nation. Mostly in India people travel through train as it is an affordable and convenient medium of traveling. Many among of us travel regularly through train and seeking to know their current PNR status or other train enquiry in urgent basis, so for them we have created this app, through this they can track down their train PNR status just by entering their 10 digit PNR Number in the given box. On doing so; result will be displayed on their device screen instantly. 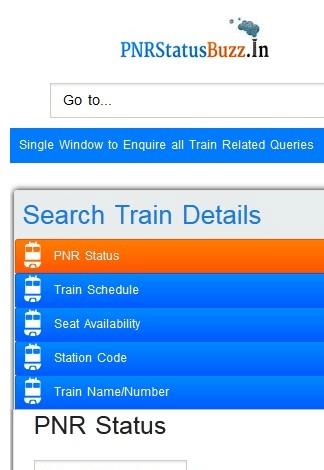 Besides PNR enquiry; it also let you check seat availability, train schedule, station code and various other things. It has various amusing features which others doesn't. All Passengers whether it's train or flight will be benefited by this App. It is simple and easy to use. Just try it; it bet you won't regret. We are eager to receive your feedback about this application, you can contact us at our website at http://www.pnrstatusbuzz.in/.